Baton Rouge, LA – November 3, 2016 - Lamar Advertising Company (Nasdaq: LAMR), a leading owner and operator of outdoor advertising and logo sign displays, announces the Company’s operating results for the third quarter ended September 30, 2016. Lamar reported net revenues of $387.5 million for the third quarter of 2016 versus $350.7 million for the third quarter of 2015, a 10.5% increase. Operating income for the third quarter of 2016 was $119.8 million as compared to $111.6 million for the same period in 2015. Lamar recognized net income of $85.1 million for the third quarter of 2016 compared to net income of $86.0 million for same period in 2015. 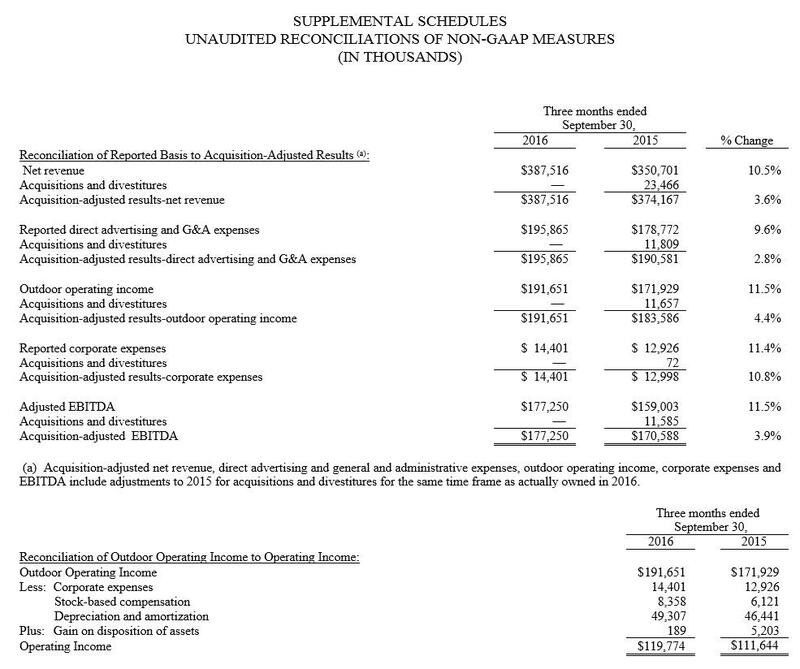 Net income per diluted share was $0.87 and $0.89 for the three months ended September 30, 2016 and 2015, respectively. Adjusted EBITDA for the third quarter of 2016 was $177.3 million versus $159.0 million for the third quarter of 2015, an increase of 11.5%. Cash flow provided by operating activities increased 1.2% to $126.8 million for the three months ended September 30, 2016 as compared to the same period in 2015. Free cash flow for the third quarter of 2016 was $116.0 million as compared to $108.7 million for the same period in 2015, a 6.7% increase. For the third quarter of 2016, Funds From Operations, or FFO, was $130.9 million versus $123.5 million for the same period in 2015, an increase of 6.0%. Adjusted Funds From Operations, or AFFO, for the third quarter of 2016 was $134.0 million compared to $122.6 million for the same period in 2015, a 9.2% increase. Diluted AFFO per share increased 7.9% to $1.37 for the three months ended September 30, 2016 as compared to $1.27 for the same period in 2015. Acquisition-adjusted net revenue for the third quarter of 2016 increased 3.6% over Acquisition-adjusted net revenue for the third quarter of 2015. Acquisition-adjusted EBITDA increased 3.9% as compared to Acquisition-adjusted EBITDA for the third quarter of 2015. Acquisition-adjusted net revenue and Acquisition-adjusted EBITDA include adjustments to the 2015 period for acquisitions and divestitures for the same time frame as actually owned in the 2016 period. See “Reconciliation of Reported Basis to Acquisition-Adjusted Results”, which provides reconciliations to GAAP for Acquisition-adjusted measures. 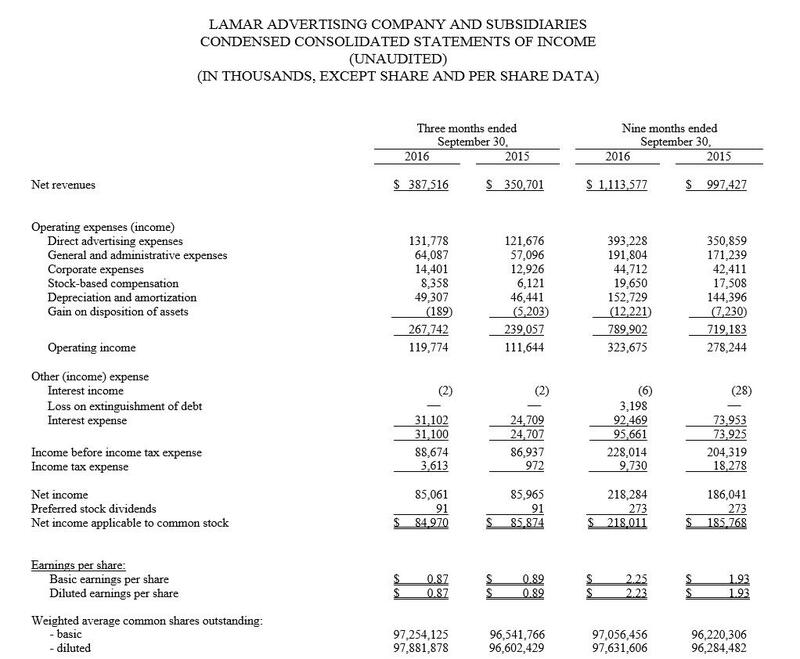 Lamar reported net revenues of $1.1 billion for the nine months ended September 30, 2016 versus $997.4 million for the same period in 2015, an 11.6% increase. Operating income for the nine months ended September 30, 2016 was $323.7 million as compared to $278.2 million for the same period in 2015. Lamar recognized net income of $218.3 million for the nine months ended September 30, 2016 as compared to net income of $186.0 million for the same period in 2015. 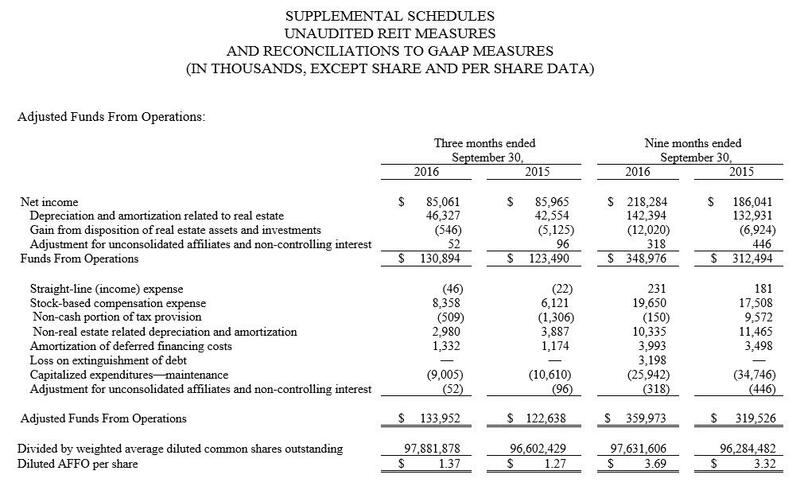 Net income per diluted share was $2.23 and $1.93 for the nine months ended September 30, 2016 and 2015, respectively. In addition, Adjusted EBITDA for the nine months ended September 30, 2016 was $483.8 million versus $432.9 million for the same period in 2015, an 11.8% increase. Cash flow provided by operating activities increased to $337.8 million for the nine months ended September 30, 2016, as compared to $313.5 million in the same period in 2015. Free cash flow for the nine months ended September 30, 2016 increased 12.3% to $306.4 million as compared to $272.7 million for the same period in 2015. For the nine months ended September 30, 2016, FFO was $349.0 million versus $312.5 million for the same period in 2015, an 11.7% increase. AFFO for the nine months ended September 30, 2016 was $360.0 million compared to $319.5 million for the same period in 2015, a 12.7% increase. Diluted AFFO per share increased to $3.69 for the nine months ended September 30, 2016, as compared to $3.32 in the comparable period in 2015, an increase of 11.1%. As of September 30, 2016, Lamar had $222.4 million in total liquidity that consisted of $184.9 million available for borrowing under its revolving senior credit facility and approximately $37.5 million in cash and cash equivalents. 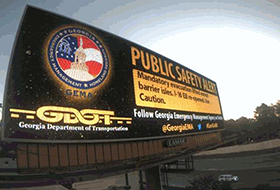 Using Twitter, state agencies in Georgia posted targeted emergency messages directly to Lamar's digital billboards during Hurricane Matthew. This high-tech partnership demonstrates the growing link between social media and out-of-home advertising.